SketchUp's Section Cut tool is awesome. To make it even better TIG wrote an extension for SketchUp to address the need to have filled Section Cuts. It is really easy to use and adds another level of sheen to your client presentations. In this tutorial we will take a quick look at some of the features the TIG's Section CutFace extension. First thing you will need is to have the extension installed. If you use our own ExtensionStore for SketchUp then just do a search. Or you can grab the .rbz file here. 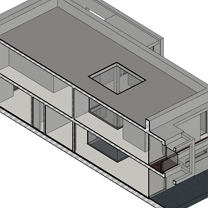 Once installed Section CutFace adds an entry to the context menu when you right-click a Section Cut in SketchUp. Go ahead and place a Section Cut into your scene using the Section Cut tool as shown below. You can use the SHIFT key to lock the orientation of the cut on the axis you want to cut at. With your Section Cut in position it is time to add the fill. Right-click the Section Cut and choose Add SectionCutFace from the context menu. This will launch a dialog with a ton of options. Here you can choose the type of fill, whether to hides edges, lock the cut etc. One of the more important aspects of SectionCutFace is the Auto Update feature. This allows you to move the Scetion Cut and the extension will update the cut on the fly if you set the option to yes. It is advised to have Auto Update set to On Demand for performance reasons. With On Demand enabled you can move the Section Cut and right-click it and choose Remake SectionCutFace to update the cut. SectionCutFace from TIG is an essential extension for SketchUp. One that keeps getting better considering it is now nearly 3 years old! For something a bit more powerful with even more features you can try out the commercial extension Skalp for SketchUp. Thank so much to Author!